Looking for interesting and impressive golf facts to share with fellow avid fans of the sport? Hole In One International has you covered. Augusta National: Home of The Masters! It’s that time again already… can you believe it? That’s right – The 2012 Masters began this week! Augusta National, which has been the home of The Masters for 78 years now, is full of interesting facts that you’ve likely never known about! Continue reading to find out more about this beautiful, renown golf course. There are several types of sandwiches sold at The Masters, but did you know that the pimento cheese sandwich is the most famous? It’s a Masters tradition! The infamous “Big Oak Tree” is on the golf course side of the Clubhouse and was planted during the 1850’s. Available for amateurs wishing to be housed there during the Masters Tournament, the Crow’s Nest provides living space for up to five individuals. 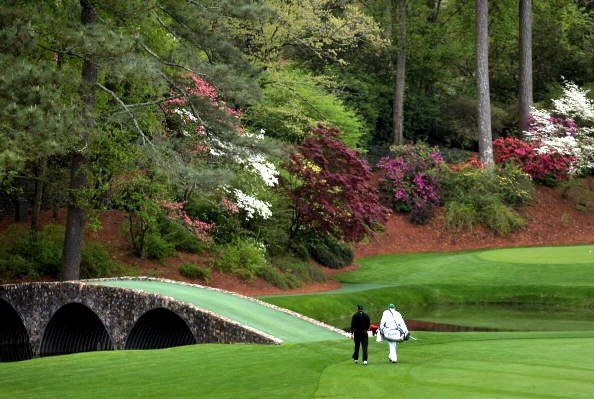 Augusta National will play at approximately 7.435 yards during The Masters this year. The Clubhouse at Augusta National was originally constructed in 1854 as a private residence — wow! Could you imagine living there? Looking to take some snapshots? Unfortunately, any type of camera is prohibited unless it’s during the practice rounds of The Masters. Augusta National has approximately 300 members at any given time and membership is by invitation only. There are several cabins scattered throughout Augusta National, one of which is named Eisenhower Cabin. This is due to the fact that it was built for the President and First Lady so that they’d have a place to stay during their trips to Augusta National. Augusta National accepted its first African-American member in the year 1990. Unlike most other golf courses in the U.S., Augusta National has never been rated! During the 1990 Masters Tournament, it was given an unofficial rating of 76.2 by USGA raters. Now that you know the facts, be sure to share them all with your fellow golfers and show off your newfound knowledge! Better yet, share your own trivia on our Google Plus or our Facebook page. Two Aces More Common Than You May Think! We know what you’re probably thinking: “Two aces during the same round of golf? What are the odds on that? There’s no way that could happen!” But according to these stories that come to us from The Northern Advocate, USA Today, Sky Sports and North Fulton, it does… and frequently, at that! In fact, you’ll notice that not only did these individuals manage to make two hole in ones during the same round, but all of them happened this year… and 2012 has only just begun! Suddenly those 1 in 67 million odds don’t seem so far-fetched, do they? The aforementioned stories are a prime example of why choosing the right hole in one insurance coverage makes all the difference! We’re glad you asked! When you choose to insure your event with Hole In One International, for as little as $150, each and every player at your event has a chance to win thousands of dollars in cash and prizes … But, unlike many other hole in one coverage companies, Hole In One International pays for multiple hole in ones. That’s right: that minimum $150 premium doesn’t cover just the first hole in one that’s made — it covers each and every one made by any/all of your tournament players. Plus, you have the added peace of mind of working with a hole in one insurance coverage company that is underwritten by an A-rated insurance company (Praetorian). Want to make sure that any lucky player making double aces during your tournament takes home a prize – or that everyone who makes an hole in one will get a prize winner this season? Then give Hole In One International a call at 800-827-2249 to speak with one of our experienced contest consultants or email us for further information on how to get started!